Sprinter Justin Gatlin has a right to earn "redemption", says the man who led the Lance Armstrong investigation. Travis Tygart, chief executive of the United States Anti-Doping Agency, believes athletes who are banned for doping offences deserve another chance. 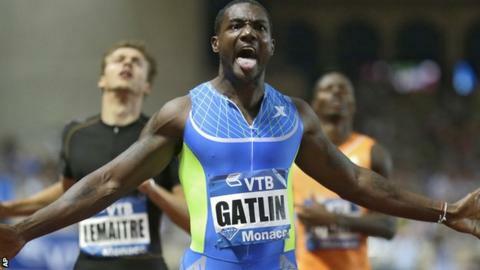 Gatlin, who has served two drug bans, is the world's fastest man in 2014. "If somebody commits a violation, serves a ban and comes back to the sport, part of the rule is this idea of redemption," Tygart told BBC Sport. Gatlin has been a controversial figure since returning from his second ban in 2011, but his stunning times this year have provoked fury from many fans and rivals. He ran the fastest 100m and 200m by a man in his thirties this summer. This anger has only increased since research from Oslo University suggested athletes could benefit from steroids for years after they stopped taking them. "There is some recent science on the effect of steroids on mice, but there is no proof yet it translates to humans," said Tygart, who in 2012 declared the "conclusive and undeniable proof" that American cyclist Armstrong was a drug cheat who was at the heart of a team-run doping conspiracy. For an athlete who commits a doping offence, Tygart acknowledges that "there is always a cloud that follows that person, but that's not a question for the rules, that's people's opinions". Earlier this week, Lord Coe, the man likely to be the next president of the International Association of Athletics Federations (IAAF), said he had a "big problem" with Gatlin, and told reporters he believed dopers enjoyed the benefits of their cheating long after their bans were over. But Tygart told the BBC the Oslo study was not the first to show a long-term effect from steroids in mice, and that nobody had been able to demonstrate that the same applied for humans. A revised version of the World Anti-Doping Code will nevertheless come into force from 1 January, 2015, extending the ban for serious first-time offenders from two years to four, long enough to guarantee an athlete found guilty of cheating will miss an Olympics. And Tygart, who was in London for the Leaders sports business summit, did not rule out further extensions. "Fairness dictates that we stick to the rules, but if the science says we have to change the rules then, absolutely, let's do that." Gatlin is not the only American sprinter to run into doping trouble in recent years. Tyson Gay, a three-time world champion, tested positive for a banned substance in 2013 but was given a reduced one-year ban by Usada - and stripped of his silver medal from London 2012 - because he cooperated with its investigation. This plea-bargain approach brought criticism of Tygart, however, with some suggesting he was letting cheats off lightly. It is criticism he rejects. "It is because we understand the bigger picture," he explained. "To give young, clean athletes a chance, we have to get those dirty team owners, doctors and coaches out of the sport, because as long as they're still there it's not going to get any cleaner." Is Gatlin's gain bad for athletics?